Toppings: sliced tomato, avocado, cheese, ketchup, mustard, mayo, hot sauce, etc. 1. In a large bowl, combine the turkey meat, oregano and garlic cloves, and mix with your hands until fully combined. Form into two patties and set aside. 2. Heat a grill pan (or outdoor grill) to medium high heat. 3. Spray the zucchini on both sides and sprinkle with salt and pepper. 4. Add the zucchini to the grill pan, cooking 2 – 3 minutes per side until you have nice grill marks and the zucchini still holds its shape. 5. 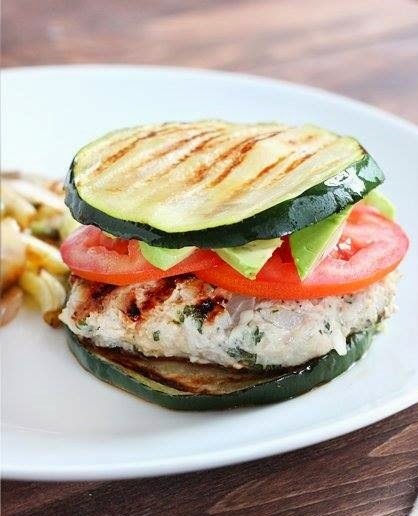 Add the turkey burgers to the grill, cooking 3 – 5 minutes per side, until cooked. 6. Serve between zucchini slices and add your preferred toppings.